A few weeks ago, I was contacted by Paradise Fruit Co. They asked if I would be interested in developing recipes using their candied fruit products. I was more than happy too and actually quite honored that they asked me. Within a few days I received a box containing candied ginger, lemon peel, orange peel, green and red cherries, pineapple, fruit cake mix and tropical mix, which I used in this recipe. I have my work cut out for me, but it will be so worth it! 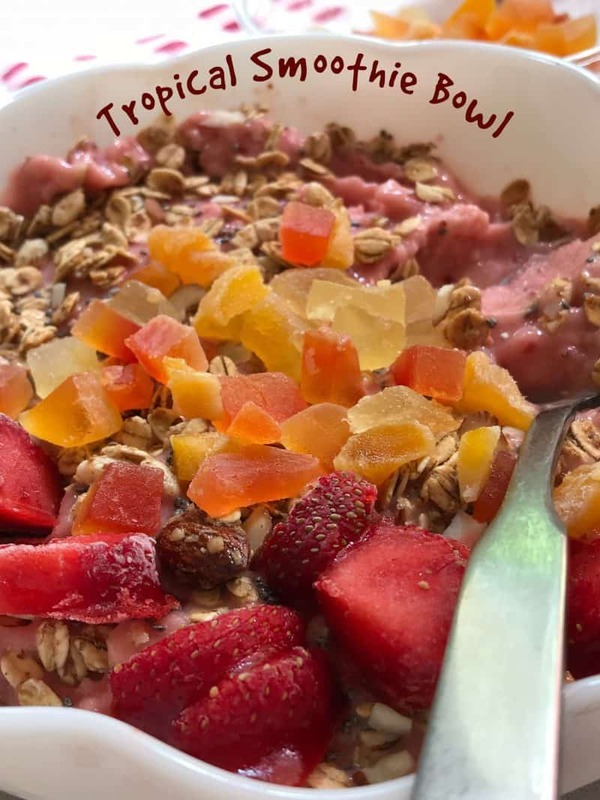 Tropical Smoothie Bowl is the first recipe of many featuring Paradise Fruit. Since 1961, Paradise Brands has been America’s favorite brand for candied fruit products. Paradise Fruit Co. has been making glace’ or candied fruit of all kinds, including candied cherries, candied fruit for fruit cake and so much more. Paradise Brands have been achieving baking excellence for over 50 years. Noted for their vibrant color, perfect sweetness and rich, chewy texture, Paradise Candied Fruit are a delicious addition to a variety of recipes. Smoothie bowls are basically an extra-thick smoothie, poured into a bowl and topped with fruit, nuts, and pretty much anything else you want to top it with, thus making the smoothie bowl possibilities endless. Not only are smoothie bowls easy to make, they are super delicious, filling and good for you too. When I’m watching what I eat, smoothie bowls are perfect. They make me feel like I’m cheating, even though I’m not. What’s in a Smoothie Bowl? 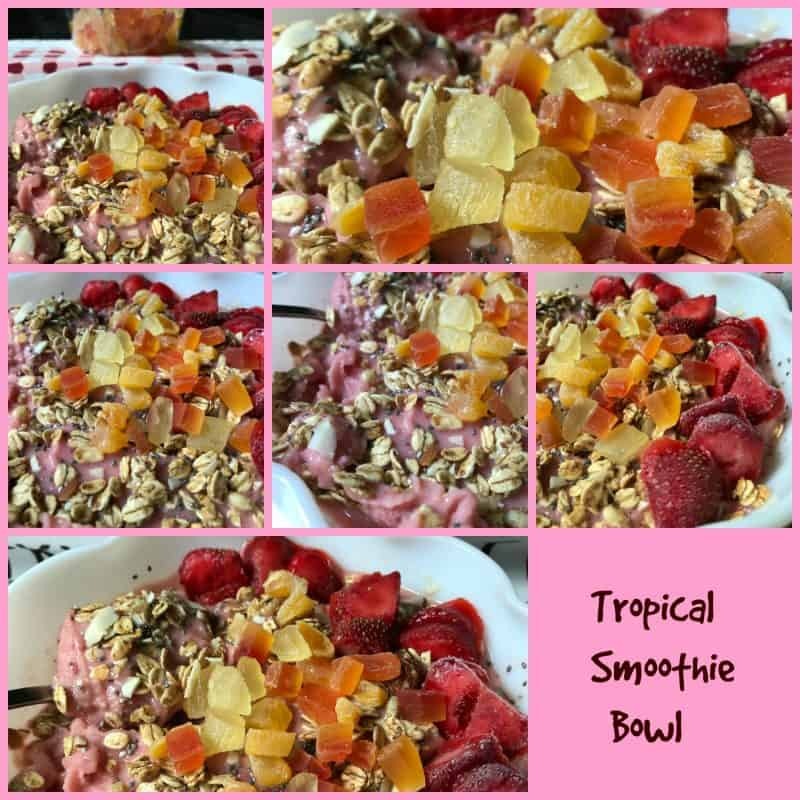 First off start with frozen fruit, which can be anything from frozen strawberries, mangoes, pineapple, blueberries, banana or my personal favorite, fruit blends or fruit and veggie blends that are available. Add that to a blender with some type of flavored liquid or combination of, coconut water, juice, yogurt, milk or a milk alternative such as almond or coconut milk. Blend until creamy and incorporated but still thick. Pour into a bowl. Now the real fun begins! Smoothie bowls are meant to be topped. 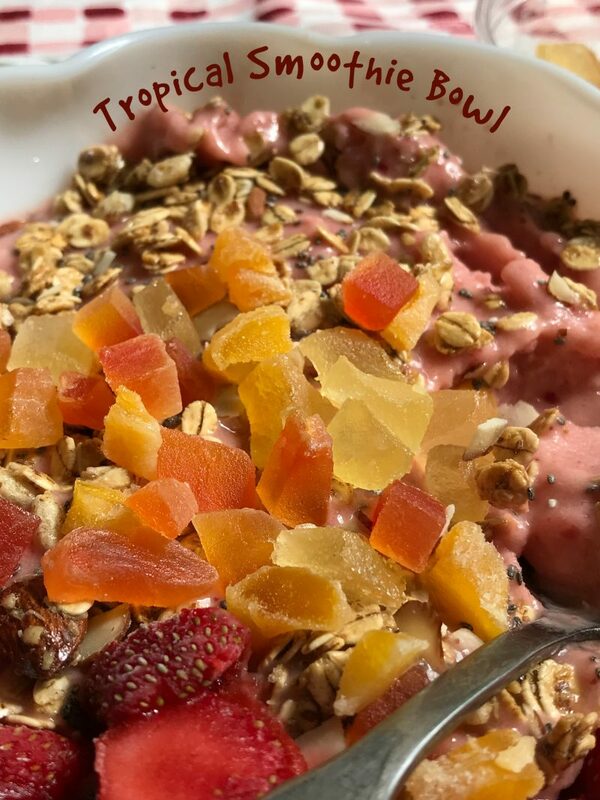 Topped with nuts such as; sliced almonds, chopped walnuts or pecans, seeds such as; chia seeds, hemp seeds, or sunflower seeds, dried fruit such as; Paradise Candied Fruit, goji berries, or raisins, fresh fruit such as; raspberries, blueberries, strawberries, or kiwi, cereal such as; granola or puffed rice. Shredded coconut and cocoa nibs are also a great addition. The end result is a smoothie bowl that is worth getting out of bed for, a quick pick-me-up in the afternoon, a nutrient-dense pre-workout snack, a light dessert or as an early evening snack. Instead of grabbing that pail of ice cream in your freezer, whip up a smoothie bowl. I love my ice cream but I’ve found that smoothie bowls can be just as satisfying as a dish of ice cream. Seriously…I’m not joking! This recipe calls for using Paradise Tropical Mix, which is a combination of candied pineapple, papaya, cantaloupe, and mango. 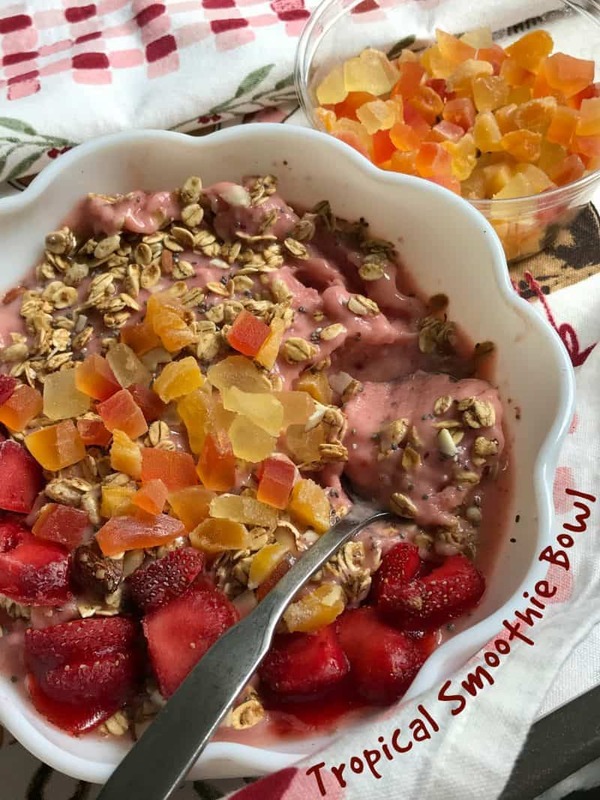 The pieces of candied fruit are rather large, bite size really, so I diced them into smaller pieces which are prefect for topping a smoothie bowl. There are so many delicious recipes you can make using Paradise Candied Fruit. Check out Paradise Fruit Co. to shop online or to find a store near you. *Thank-you for supporting the products and companies that support Turnips 2 Tangerines. Recipe Tip: Next time the bananas on your counter are starting to get too ripe, peel them, throw them in a plastic bag and put them in the freezer. That way you’ll always have some on hand when you want to make this super-creamy smoothie bowl. In a blender, combine frozen tropical fruit blend, frozen whole strawberries, coconut milk, yogurt, banana, and honey. Blend until the mixture is well blended but still thick. Pour mixture into a bowl. Arrange the sliced strawberries on top. Sprinkle with chia seeds, sliced almonds, granola, coconut and Paradise Tropical Fruit. Serve immediately. Hungry for more? Take a look at these..Chocolate Crinkle Blossoms, Coconut Macaroon Nests and Impossible Coconut Pie.